While many of us sit and dream to reach the skies, a few of us actually do. They prove to the world that no dream is too big and that with dedication and true spirit, one can reach the zenith and feel the happiness of being on the cloud 9. With these twin sisters from Haryana who now reside in Dehradun, this was ‘literally’ the case. Tashi and Nungshi Malik, are the first twin sisters to climb Mount Everest together. 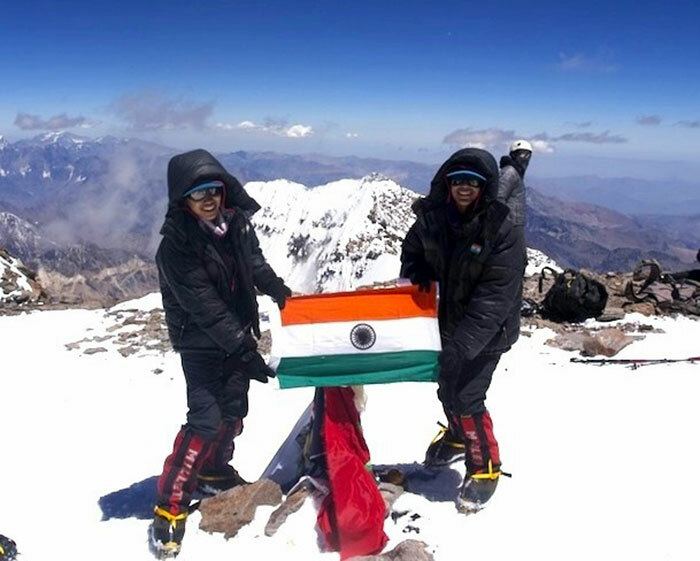 They participated in the ‘Explorer Grand Slam’ and faced a lot of difficult situations to become the fastest South Asians to complete this challenge. The Grand Slam is an adventurer’s challenge to reach the north and south pole and climb the 7 summits. The 23-year-old sisters are the youngest in the world to have completed this challenge. Since 1998, about 44 other people have been able to complete this challenge. Their journey was not easy at all. They had to face all kinds of barriers before they could reach the heights. It initially began as a hobby during vacations. They had joined a mountaineering course and had a great first experience. And then, they were unstoppable. Their parents were worried about their safety like any other parents. Their mother would often ask the instructor to fail them in the test so that they can’t compete ahead. Nonetheless, their parents were extremely supportive when it came to the financial viability of the trip. While their father exhausted all his savings to fuel their dreams, their mother took a loan and made sure that the girls could compete in the grand slam. The Malik sisters climbed the Mount Everest in May 2013 and then went on to climb the highest peaks in all the seven continents including: Mt. Kilimanjaro, Denali, Aconcagua, Vinson Massif, Mt. Elbrus, Mt. Kosciuszko and Carstensz Pyramid. Recently they scaled the 5,895 meters high Mt Kilimanjaro, the tallest free-standing mountain on Earth and the highest peak in Africa, on July 3, finally completing the Explorers Grand Slam. Icy winds, deadly heights, unexpected weather, and hallucinations were few of the many life-threatening problems that they faced during their journey. Even though the twins are appreciated by their friends, family and mountaineering enthusiasts, they said they have not received any financial support from the Centre. “Mountaineering is a great sport, but it has our my parents in debt. Though we scaled many heights for our country, not even a single penny has been provided by the government,” the twins said. The twins are also an ambassador of the Beti Bachao movement – a government initiative to prevent female foeticide in India which is wide-spread in their native state, Haryana. Mountaineering also takes an emotional toll on the twins, who leave loving notes for their parents before they embark on their next adventure. “We’ve lost 25 of our climber friends in the last one and a half year,” Nungshi told the media. On being asked about their next adventure, they gleamed and said, “Mt. Cook in New Zealand and a few virgin peaks around the world.” They are also planning to publish a book on their journey so far. Well, if they really do publish a book like that, it would be a really good book to read. A 7-year-Old Girl Got Raped In Delhi, Is There Any End To It?